live-action feature The Pink Panther. When it came time to branch out, the studio's third series was about an animation staple, a predator/prey pair like Tom & Jerry or Road Runner/Coyote. They went for a lowly ant as the prey, with an anteater, or aardvark, trying to capture and eat him. Possibly the choice was made so they'd have plenty of scope for funny character designs. 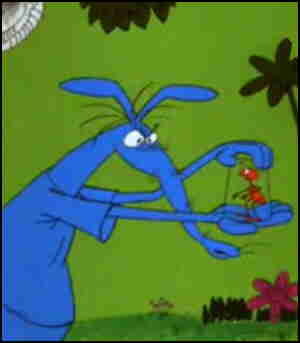 The first episode of the new series, titled simply The Ant & the Aardvark, was released to theatres on March 5, 1969. Both voices were done by John Byner (Bill the Cat in TV animation starring Bloom County/Outland's Opus the Penguin). The series was reasonably successful, with 16 additional entries released over the next couple of years, ending with From Bed to Worse, which came out on May 16, 1971. Byner continued to do both voices. While the series was still in production, the cartoons started turning up on The Pink Panther's TV show. They continued to appear as back segments on TV, as did The Tijuana Toads, The Blue Racer and everything else the studio did for theatrical release. In 1993, the 17 cartoons were supplemented with new ones, made especially as TV segments. Today, The Ant & the Aardvark can still be seen in that venue, if you look hard enough. It's much easier to find them in the DVD edition that was released in 2007. Text ©2008 Donald D. Markstein. Art © DePatie-Freleng.